Katsa has been able to kill a man with her bare hands since she was eight — she’s a Graceling, one of the rare people in her land born with an extreme, and in her case horrifying, skill. As niece of the king, she should be able to live a life of privilege, but Graced as she is with killing, she is forced to work as the king’s thug. When she first meets Prince Po, Graced with combat skills, Katsa has no hint of how her life is about to change. She never expects to become Po’s friend. She never expects to learn a new truth about her own Grace — or about a terrible secret that lies hidden far away... a secret that could destroy all seven kingdoms with words alone. 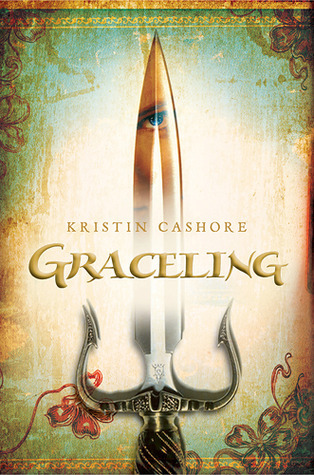 Short & Sweet: Graceling completely blew me away. The characters, the world, the plot… all of it was pure magic. Ms. Cashore and her world are unique in a way that surprised me. It was full-bodied and complex, but not difficult to understand or follow. Readers are presented with an elaborate tale that is easy to get swept away in. And that is only part of what makes Graceling so unforgettable. Final Verdict: Graceling is an astounding read. One that I wish I had not put off for so long. It is a breathtaking world filled with fantastic characters, romance, and plenty of adventure. You will not want to miss this fantastic tale. wow it is def. one of the books I am dying to read! Oh, the cover! I’d buy it no matter what the story was about with that cover! I’m so glad you loved this book. I’m in awe of Cashore’s writing and the world and characters she creates. Graceling has become one of my favorite books! I love this one too! I listened to the audiobook and would highly suggest it for those who like to read with their ears. It is a full cast recording which sometimes doesn’t work out so well, but in this case is extremely well done. Agreed. I love this book. I also agree with Em who said that audio book was great. I read it and listened to it and it was fabulous both times, but the audio book is something special. Glad you liked it so much, Kate! Fire, the sequel/prequel, is just as fabulous!